H.V. KALTENBORN - 28 YEARS IN NETWORK RADIO WITHOUT A SCRIPT. "MAKE IT GOOD, OLD BOY..."
H.V. Kaltenborn was at the peak of his career and in the second of four consecutive Top 50 seasons in 1942-43. His 7:45 p.m. news commentary on NBC had been expanded from three to five nights a week and he had overtaken newscaster Lowell Thomas with Network Radio’s most popular Multiple Run program. Kaltenborn, 65, was earning a reported $200,000 annually from sponsor Pure Oil, for which he considered himself lucky after years in the lower paying newspaper business. Far from it, Kaltenborn remained a radio and television notable for another dozen years, doing what he always felt he was destined to do, reporting and analyzing the news. His pursuit news put his life at risk several times and his objective analysis of what he observed caused him to lose several jobs. Yet, he never yielded to danger or pressure. He was truly an outstanding journalist, worthy of the title bestowed by his peers, The Dean of Broadcast Commentators. Remarkably, that phase of his career didn’t begin until he was nearly 50 years old! Hans von Kaltenborn was born in July, 1878, to immigrant parents in the German-American community of Merrill, Wisconsin, 200 miles northwest of Milwaukee. He was a bright and popular bi-lingual student in high school, nicknamed Spiderlegs Kalty by his classmates and particularly adept at extemporaneous debating. He joined the U.S. Army shortly after graduation at the outbreak of the Spanish-American War in 1898, a patriotic act that also began his professional newspaper career. The 19 year old Kaltenborn began sending weekly dispatches from his army training camp in Anniston, Alabama, to The Merrill Advocate with a second copy in German to The Lincoln County Anzeiger. With these credentials he also got himself appointed The Milwaukee Journal’s “special correspondent” attached to the Fourth Wisconsin Infantry in Anniston. The war was a quick one and young Hans never left the country, but the limited experience gave him a thirst for travel that was never quite quenched. So he delayed college and returned home determined to earn enough money to tour Europe - as a reporter for The Merrill Advocate with the promise of becoming the paper‘s first, (and only), foreign correspondent. Shortly after his return to the paper, Kaltenborn was sent to Washington to become its capital reporter in a temporary shuffle that had him back in New York again in 1911 as The Eagle’s drama critic with additional duties overseeing its editorial and political columns. That period, which Kaltenborn later recalled as one of his favorites, ended in late 1913. when he was given another temporarily assignment. Hans and Olga took their three year old daughter and boarded a ship for France, where he headed The Brooklyn Eagle’s Paris bureau for six months. To its credit, The Eagle stood by its 39 year old War Editor who quietly dropped the “Von” from his name to become H. V. Kaltenborn for the remaining 47 years of his life. (5) The paper’s confidence in Kaltenborn was tested on November 8, 1918, when the United Press floated a rumor that World War I had ended. The rumor became “fact” prompting extra editions of newspapers and street celebrations. But The Brooklyn Eagle was silent, only saying “Armistice Still Unsigned” on its building’s message board. An angry crowd broke into the paper’s newsroom, demanding that its “Kraut War Editor" admit that the Allies won the war. But Kaltenborn and his management refused to cave while waiting for confirmation. History finally proved them right three days later. Kaltenborn’s editorial prestige was furthered in September, 1921, when he was dispatched to Geneva for the first meetings of the League of Nations followed by stops in Germany, Austria and France on the way home where he found postwar resentments coupled with political and economic chaos. The Brooklyn Eagle printed two pages of letters, selected from over a thousand, protesting the end of Kaltenborn’s commentaries on WEAF. He next popped up on Long Island’s WAHG, the first in a string of small stations in the New York vicinity that would broadcast his commentaries until the protests began. Finally, powerful WOR/Newark ended his exile with a 15 minute Monday night commentary at 8:00, The Kaltenborn Digest, again sponsored by The Brooklyn Eagle. H. V. Kaltenborn never worked from a script - just notes and memory. This makes his Tuesday 8:30 p.m. debut on CBS in 1927 all the more impressive. He stood before the network microphone and spoke extemporaneously for 30 minutes, just as he did in lecture halls. He continued these weekly broadcasts while continuing his day job as Associate Editor of The Brooklyn Eagle until the newspaper’s new ownership attempted to cut his salary by 50% in 1930. At age 52, Kaltenborn decided his future lay in what had become his major source of income, lecturing, and the in new medium of Network Radio. He left The Eagle after 28 years and signed a contract with CBS, which was then assembling a news department under the ambitious direction of Paul White. Kaltenborn Edits The News became a wandering program in search of a permanent timeslot in the early 1930’s, while CBS assigned its sometimes controversial commentator to additional duties which included covering the 1932 Democratic and Republican National Convention with Ted Husing. Kaltenborn returned home two weeks later, unharmed and the first hero in the early years of broadcast journalism. CBS “rewarded” him by moving his weekly 25-minute commentary on Friday nights at 6:35 to Sunday nights at 10:45 and reducing it to 15 minutes. This was actually a major gain stations carrying Kaltenborn’s commentaries, following the 45-minute Gillette Community Sing starring Milton Berle on CBS. When the Berle show was cancelled, in October, 1937, Kaltenborn took the 10:30 half-hour for Headlines And Bylines, sharing host duties with CBS newsman Bob Trout and later with staff announcer Ralph Edwards. (7) The network refrained from selling their star commentator’s program to a sponsor, so it went unrated and the size of his audience will never be known. Because of the five and six hour time difference between New York and the European capitals, both CBS and NBC went into 24 hour operation. During the 20 days of leading up to the notorious Munich Agreement, Kaltenborn didn’t leave CBS - he lived, slept and ate in its offices, on immediate call for 102 separate broadcasts ranging from two minutes to two hours as information filtered in from London, Paris and Berlin. (8) Because he spoke both French and German, he was able to listen to foreign broadcasts in his earphones and immediately translate what he heard for his CBS listeners. Kaltenborn continues in his memoirs: “When the Czechoslovak crisis began CBS was prepared to cover the progress of events thoroughly and completely… Largely because of this advance preparation CBS managed to capture the bulk of the listening audience throughout the duration of the crisis. The intensity with which America listened to the radio reports of the Munich crisis was without parallel in radio history. Never before had so many listened so long to so much….the American people heard in person every leading figure in the crisis - Hitler, Chamberlain, Mussolini, Daladier, Benes, Eden, Masaryk. In 1938, all of this was still a novelty and much of it unprecedented. Two way transmissions enabled me to talk with newsmen in different foreign capitals while all America listened in. On several occasions I was able to tell a man stationed in a foreign capital news of which he was totally unaware because of censorship. Hans & Olga flew to Great Britain on August 3, 1939, where he had arranged to broadcast his CBS commentaries from BBC’s London studios. The couple made brief side trips to Paris and Berlin but were prevented from visiting Warsaw and Copenhagen. They flew back to the United States on August 30, 1939, two days before Germany invaded Poland and four days before England and France declared war on Germany. CBS welcomed him home with a new timeslot on September 25, four nights a week at 6:30. His reaction to the fall of Warsaw is contained in his broadcast of September 27, 1939. Another broadcast from this period, October 6, 1939, is in response to Hitler's speech to the Reichstag several days earlier. From October 16, 1939, Kaltenborn describes the first German bombing raid on Britain, in Scotland. And from a week later, October 23, 1939, he discusses peace negotiations with Japan. 62, realized that his lecturing income would be reduced by limited wartime travel and a guaranteed weeknight program with the promise of no censorship had enough appeal to make him forget his squabbles of 1923 with WEAF and WRC, which, Schecter reminded him, was before NBC owned the stations. It was a good move that finally gave proof of Kaltenborn’s popularity. His first of ten rated seasons at 7:45 p.m. on NBC resulted in the first of six in double digits and five in the Annual Top 50. (See The 1940-41 Season.) Kaltenborn’s peak was 1941-42 with a 15.2 Hooperating and 22nd place in the Top 50. An historic recording of poor quality from that season contains Kaltenborn's commentary about the Pearl Harbor attack broadcast on the afternoon of December 7, 1941. Sloppy technical work interrupts the start and cuts off the end of his analysis of the Allied victory in Europe on May 7, 1945. The usually reserved Kaltenborn becomes uncharacteristically enthusiastic in his six minute special commentary of August 14, 1945, hailing the Japanese surrender and the end of World War II. 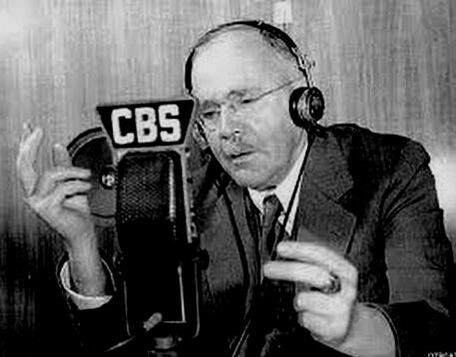 The biggest gaff in Kalenborn’s career came on Election Night of 1948 when he predicted on NBC Radio and Television - along with others - that late-counted rural votes would elect Thomas Dewey the next President over incumbent Harry Truman. It didn’t happen and Truman got his revenge at a subsequent banquet when he performed a pretty good impersonation of Kaltenborn’s prediction. Embarrassed, but not angry, the good natured 70 year old Spiderlegs Kalty took it in stride and continued on with a limited schedule until 1955. In tribute to their friend, Ed Murrow on CBS, ABC’s Elmer Davis and Bill Henry on Mutual all devoted segments of their programs to salute NBC’s H.V. Kaltenborn, 74, on his 30th anniversary in radio on April 4, 1952. (2) World War I broke out in late July, 1914. (3) Hans & Olga von Kaltenborn remained married until he died 55 years later in 1965. The union resulted in two children, daughter Anais, (b. 1911), and son, Rolf, (b. 1915), seven grandchildren and six great grandchildren. Olga died in 1977 at age 88. ​(4) Making matters more awkward, Kaltenborn’s uncle, after whom he was named, Prussian General Hans von Kaltenborn-Stachau, was Germany’s War Minister from 1890 to 1893. ​(5) This was actually a restoration. Kaltenborn, like his father, substituted “V” for “Von” many years earlier. Harvard, however, insisted that he use his full name in college, and he continued using it until 1917. (6) WEAF attempted to cancel Kaltenborn months earlier when he refused to submit his scripts for approval, (he worked from notes), and tame his “offensive” editorial remarks. The Eagle responded that if WEAF cancelled Kaltenborn it would be forced to print the motives for its censorship. (7) The same Ralph Edwards created Truth Or Consequences on NBC in 1940. (8) Olga Kaltenborn kept her husband supplied with fresh laundry and homemade soup during his broadcast marathon which has never been matched.